Without actually mentioning it by name, the Prime Directive comes into play on a whole new level of advancement in the Genesis plot line that carries through Star Trek feature films 2 and 3. Witness the original mission of the U.S.S. Reliant, on assignment from Dr. Carol Marcus' team of scientists on Space Station Regula One. Their mission was to find a completely lifeless planet or moon on which the Genesis device could be "safely" tested. In the words of Carol herself: "There can't be so much as a microbe, or the show's off." In other words, this Federation / Starfleet group effort needs to reassure themselves that, even with a technology that can almost instantly mold life on a planetary scale, they aren't interfering with the "natural development" of any other lifeforms that may already be present there, even those so "primitive" that they haven't developed beyond single-celled forms. And something present in the film, but even more magnified in Vonda N. McIntyre's official novelization, is the fact that Reliant is having a very, very difficult time finding a planetoid with absolutely no life of any kind. Virtually the opposite of what conservative astronomers are estimating as probabilities out among the stars. It is partly a conceit on the part of the Genesis scientists that lifeless anything exists anywhere in the universe. While it seems plausible to think of dead moons based on generally accepted theories of what constitutes life by the official human science of the 1980's when this film was made, broader holistic theories have since found greater favour by the wise, indicating that everything in the universe is alive and interconnected. If one were to measure the rate of vibration of consciousness on a scale of seven densities, as outlined in our article on "The Fourth Density", most of what is normally considered to be alive by our old science falls into the limited range of second through fourth density. Each time any science fiction story has a team of explorers figuring out that the phenomenon they're investigating is actually alive, I think, "D'uh?! Why would that not have been your first assumption?" The search by Dr. Carol Marcus and the Reliant for a lifeless space body is probably doomed to failure by the very nature of the whole universe being alive on some level already anyway. Thus Genesis isn't really bringing life; it's just changing it from one form to another, which starts to sound like a "life" version of the Law of Conservation of Energy. There may be no way of operating Genesis within the confines of The Prime Directive. If you want to perform terraforming, you've got to be brazen enough to make an evolutionary impact and stand by the influence you've exerted on the universe. Interesting too is the Klingon perspective of Genesis heard in the third film. Even if it is a propaganda-like viewpoint, it has its basis in truth as well. Why should the natural life of the universe be converted, planet by planet, into something more agreeable to human beings? What right do they have over other creatures to decide what a planetary environment should be? Perhaps rather than looking for the elusive lifeless planet, the Regula Scientists would be better to follow the example Spock sets in Star Trek 4, where he mindmelds with two humpback whales to ask for agreement before he and his fellow crewmates transport them three hundred years into the future. Instead of avoiding the negotiation for agreement by pretending that there's no intelligence out there, just accept that it's everywhere and gain agreement prior to terraforming. Sure communication on that level isn't all that feasible yet, but neither is the Genesis project. Let's trust that Genesis as seen in the films isn't something we will be able to do before we understand how to find agreement with all of the life that fills the universe so wondrously. And it is clear from the storyline of the movies that real steps for reaching agreement with intelligence have been skipped. Obviously the Klingons have a somewhat legitimate bone to pick politically, but from a more scientific perspective, Dr. David Marcus admits to Lt. Saavik that he went against agreements by common scientific bodies in order to use "proto-matter" to "overcome certain problems" with Genesis. I'm not sure this short scene's only purpose was to give reason for the planet's break-up, as it seems that using a Nebula as the raw material for the process instead of a more solid moon or planet might be cause enough for what happens. This scene also ensures that David is seen to be in the driver's seat of his own destiny, and not just an innocent victim. I never was pleased with what happens to him in this film; in my mind I see neither a Klingon wielding a knife in front of him, nor any instrument of his own creation. Instead I simply see writer Harve Bennett. Isn't it always the case that the true killer of any character is the writer who sets the scene and carves it into celluloid? Whatever David may deserve for his arrogance with Genesis, and whatever Kirk's character may get in terms of emotional territory to explore, it isn't the version of events I would have preferred. There were richer avenues of exploration with Genesis, Kirk, Saavik, and untold other elements as yet unimagined had David remained to add his presence to future stories, and I'm not very enamoured with what his absence added to this one. Particularly in terms of Kirk's progress in developing a family, which will be brought up again in the seventh film, it virtually returns him to his starting position, a flaw that many 1960's, 1970's, and 1980's TV shows including Star Trek perpetuated on a weekly basis. Developing and moving forward is a better formula for finding new territory to explore. 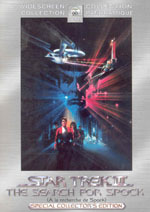 One of the featurettes on the Special Collector's Edition 2-disc standard DVD release of Star Trek III is entitled "Terraforming and the Prime Directive", offering further debate on the ethics of the Genesis Project, while spending a great deal of focus on thoughts of terraforming Mars. A lot of interesting points are raised, including perhaps an oversimplification of the Genesis Planet as David Marcus' Frankenstein monster. I think we can fall into a lot of traps when we oversimplify and try to say that this new work just follows the pattern of this older work, and I do think that groups and results are better formed from examples (a.k.a. enticements) than from warnings. As I often like to say, "The stick may provide speed, but without direction from a carrot, you'll be going nowhere fast." And you can quote me on that. Dr. Louis Friedman speaking on the featurette nicely remembers his Heisenberg principle when he says that the minute we humans step onto the surface of another world, we have brought an impact of some sort to their ecosystem - I would even go further to include the robotic explorers we've already sent to Mars. Also on the featurette is astrobiologist Chris McKay who went on to become a regular contributor to seasons 2-4 of the documentary series "The Universe", and where many of the ideas presented here were explored further. Here, as he studies how life on Mars might have become extinct, he seems curiously tunnel-visioned in his search, as though geology alone should be able to provide the answer. His information about Mars not having plate-tectonics to recycle elements is fascinating, but seems to need the additional idea of the disrupted magnetic field of Mars allowing the atmosphere to escape to space - the pressure of that atmosphere also being required to increase the temperature range at which water can be liquid on the surface of Mars from its present span of 10 degrees Celsius to something closer to the 100 degree span that we enjoy here on Earth. But also, my bet is on archaeology providing the most important clue to the mystery of what happened to life on Mars... and I'm sorry about all the exponentially more complex variables that need to be taken into account once intelligence becomes a factor. I'll bet Martian civilization was involved in high tech warfare, and the planet's ecosystem was "nuked". Try that on for Prime Directive interference. Well, my ramblings must, at least temporarily, end sometime, so I'll call it a day on this subject for now. And thank you Star Trek for triggering the debate, again and again, on through the years! 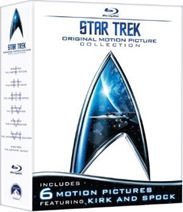 Read the next Star Trek review: "Star Trek 4: The Voyage Home"
Star Treks 2 and 3 are available in various incarnations on DVD and Blu-Ray. Audio commentary by director Nicholas Meyer. Text commentary by scenic artist Mike Okuda. William Shatner (Captain Kirk), Leonard Nimoy (Mr. Spock), and Ricardo Montalban (Khan). with ILM supervisor Ken Ralston. Montalban, and DeForest Kelley (Dr. McCoy). Most featurettes from the 2-disc DVD are included. version of the film with a different length. director of photography Charles Correll. Or, get all 6 original crew feature films* on Blu-ray at once with an exclusive bonus disc. * The only caveat is that the first two films are the old theatrical releases instead of the directors' cuts, which have very different timings, and so the audio commentaries from the collector's editions are not included. 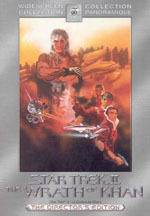 So hang on to your collector's editions of "The Motion Picture" and "The Wrath of Khan", or seek them out as well if you don't already have them.